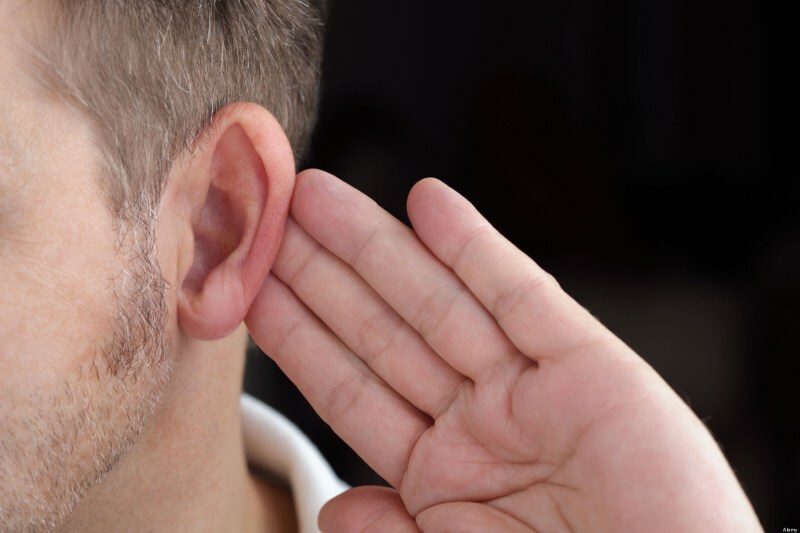 Conductive hearing loss is the most common type of hearing loss, and refers to the inability of sound to travel through the tissues from outside the ear to the inside. In essence, conductive hearing loss results from the reduction in transmission of sound waves to the cochlea, which forms a part of the inner ear. Conductive hearing loss may be due to numerous reasons, including the impaction of wax (cerumen) within the ear, tumours that destroy the inner ear, an abnormal shape of the external ear (the pinna), calcification of the ossicles within the ear (called otosclerosis) and a cholesteatoma. Infection of the ear, called otitis media is also a recognised cause. Head trauma and a perforated eardrum are other causes of conductive hearing loss. Deafness is primary symptom, though the onset will be fairly gradual and the condition slowly progress. Patients may find that the hearing loss has affected their ability to understand speech, though they continue to speak in the same frequency as always. On examination, there may be clear evidence of an infection, injury or tumour. The Weber’s test that is performed in hearing loss will be abnormal, with the sound better heard in the ear affected by conductive hearing loss. Rinne’s test will demonstrate that bone conduction is better than air conduction. Specialist audiometric tests are also available to make a diagnosis. Pure tone audiometry can help differentiate sensorineural deafness from conductive hearing loss. Referral to an audiologist is usually done, as a series of tests may be performed to ascertain the cause of the deafness along with the degree of deafness. In the event that a cause of hearing loss is identified, patients will need specific treatment. For example, patients who have an infection within their ear, a course of antibiotics can help clear this. Patients are advised to not panic if they have hearing loss, and seek medical attention if they experience it. In patients in whom conductive hearing loss is due to accumulation of ear wax, a visit to the ENT surgeon is warranted. The wax can be gently sucked out and this can correct the hearing loss straight away. Some cases such as tumours and perforations will need specialist surgical intervention. This holds good in the treatment of otosclerosis. Patients will also be offered hearing aids to help them hear. Conductive hearing loss is a common form of hearing loss. It can occur due to a number of reasons, and can be diagnosed by an audiologist. Treatments depend on the cause and must be done as soon as possible in most cases.